Health and wellness – Thoughts from "him"
Yikes — I need more sleep! Just ran across this one today… and it’s telling me what I already suspected but didn’t want to admit to myself. Time to make some changes, neh? On 2014.11.05 a member of one of the .NET User communities I’m a part of asked how [paraphrasing] “those of us who were able to pick up the Band are liking it.” This is the response to that email. I’m loving it. Prior to this I haven’t worn a watch in years so I don’t have a basis for saying “It doesn’t feel like a regular watch”. It doesn’t annoy me and the benefits far outweigh any minor inconvenience I might experience. For example it’s forcing me to use proper wrist posture on the keyboard to make sure I don’t bounce the Band on the desk. That’s actually helping me, and I would be doing the same thing if I were wearing an expensive wrist watch. 1. How many steps I’ve taken at any point of the day. 2. What email just made my phone vibrate (and from who). 3. Who is texting me and what they said. 4. Who is calling me. All without taking my phone out of my pocket. Invaluable during meetings (business and personal). 5. Did I mention the range on this thing is great? That I can check email from entirely across the room? 6. For the most part you don’t get the usual Bluetooth drop outs with this because it’s not transmitting audio data. 7. Having that “dumb” alarms, stop watch and timer functions on my wrist is awesome. 8. I still have access to all the “smart” functions (in #7 above) via the phone as well. 9. ANY app that throws toast notifications automatically* notifies the Band. * You have to have the Notification Center app enabled on the Band. 1. How display apparently is not Gorilla Glass. 2. How the unit scratches so easily. 3. The band material likes to attract dirt and lint. 4. There’s no app to control music; I have to use Cortana. 5. It doesn’t work directly with indie apps unless they are Cortana enabled. 6. When using Cortana for queries through the Band… unless Cortana has a specialized interface for the query response you’ll have to take out the phone to see the results. Seems like a lot of gripes but in all actuality I LOVE THIS THING. So I was reading through coverage of the Band on Ars Technica and of course I was pumped when I saw an opportunity to compare the Band with the vaunted Garmin Forerunner 610. 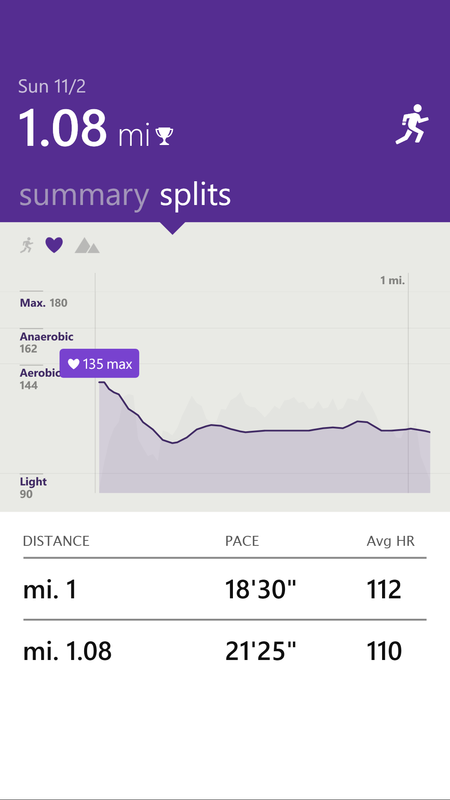 I’m very satisfied with Band in every area… except for accurate HR readings while exercising. Let me be clear; the Band did provide good heart readings and they were consistent for whatever they were measuring; I just have no idea what that was. Eventually I’ll do some research and probably discover that it’s monitoring a subset vs. the entire array that the 610 measures. While the differences are significant the representative curves, once they are averaged and smoothed out, are similar enough to satisfy me. See for yourself. So, the final verdict is that the Band is perfect (for me) for just about everything except knowing my *exact* heart rate while exercising. 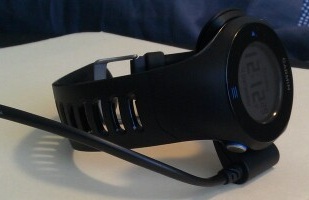 In fact, it’s great for anyone who is into any level of fitness and doesn’t need highly granular data tracking. If you need highly accurate HR readings to compare against exact elevation or pace markers then you’re going to want to stick with your existing solution. For everyone else? This thing is great. It syncs *immediately* with your phone over BT4.0, so no need for a computers and pesky dongles. I wouldn’t call myself wildly successful. At least, not by the terms my professors and peers would use. Don’t get me wrong; I’m pretty good at what I do and I love my hobbies; but I think every successful person desires “more”. Usually that “more” is different for everyone, but sometimes? Sometimes that more is the same for everyone. I ran across this gem this morning when I should’ve already started my workday… but I simply had to share. I hope some of the people that I know and love get as much out of it as I did and will. The author is performing a philosophical brain dump. He is “talking” as he talks to himself. The topic is Failure, and how to avoid it. The post is quite long and author goes into a tangential digression in the form of many stories. The anecdotes are competing though, and the “one-off” parallels to my own life/career/way-of-thinking (as I like to call them) resonate deeply. Surprisingly, the first one that hit me was “G) HUMILITY”. He wasn’t talking about arrogance in general, but the effect of entitlement (in any shape or form). I got caught up in the local rat race about 2 years ago and had forgotten how much I felt (and still feel) the same way. … Especially since it is an article about how Target Stores figures out how to market to you. “Habits aren’t destiny — they can be ignored, changed or replaced. But it’s also true that once the loop is established and a habit emerges, your brain stops fully participating in decision-making. So unless you deliberately fight a habit — unless you find new cues and rewards — the old pattern will unfold automatically. … because I just figured out what the actual problem is. And if your problem is the same as mine then you don’t need to send the watch back or exchange it for another one. Customers have complained that the 610 won’t keep or take a charge, and in some cases actually actively discharges while plugged in. Customers have also complained that the 610 sometimes will charge and sometimes it won’t, or that it wasn’t charging before and now it does. My situation went from being #1 to #2 after about 2 weeks of me owning the watch. Then, 2 weeks ago (I’ve had mine for about a month now), it all of a sudden started working. What did I do differently? 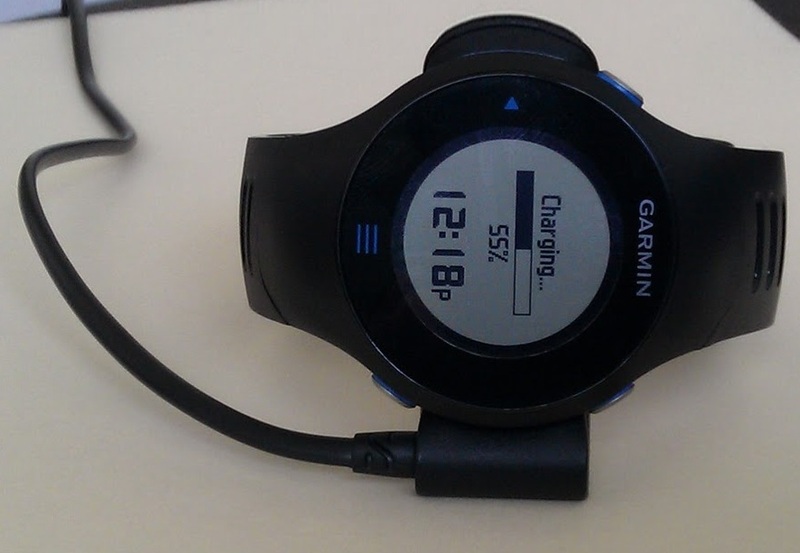 (This is the part where being pissed comes in…) It seems that Garmin, in their infinite wisdom, decided to save money by developing a charging block that can accept various terminals. 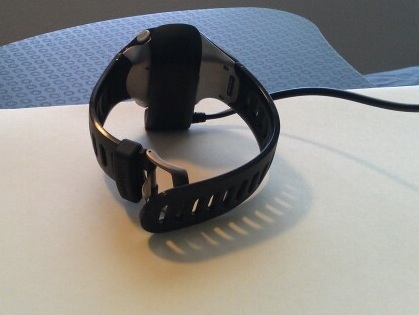 I’m sure this is to facilitate charging your watch while you travel internationally since we all do that so often. 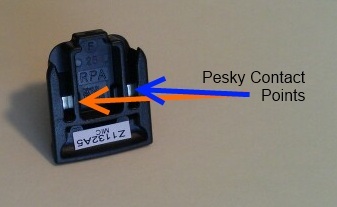 Well, have you ever noticed how that interchangeable terminal doesn’t always sit flush in the block, in fact it rarely does? Yep, you see where this is going. Long story short, you’ll have to figure out a way to keep the terminal in good contact with the two pins on the charging block. My proving solution was to get an extension cord (for computers, not the brown one at the grocery store) so I could rest the block vertically on the floor. With enough patience I was able to get the watch to start charging, consistently. You can tell because it will go through that “beep! buzz… beep! buzz…” cycle that drove us all crazy when we first got the watches, but it will settle down and stay on the charging screen once you’ve got the contact just right. Make sure you’ve got the charging stand in the right position. Yes, I said charging stand. check out the photos to see what I mean. Make sure you’ve got good contact with the watch in the charging stand. 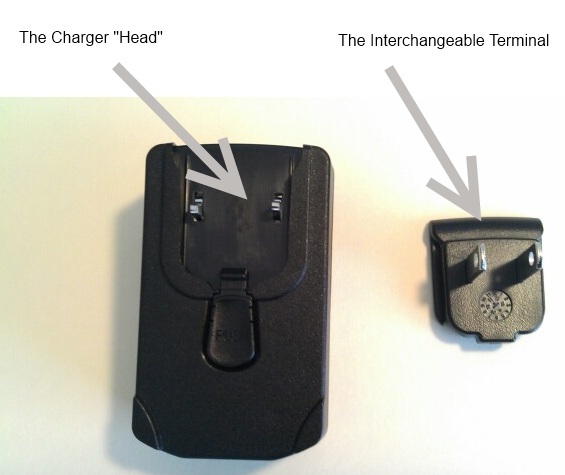 Make sure you’ve got good contact between the interchangeable terminal and the pins on the charging head. My next test will be plugging the block into the wall directly, but upside down. Hopefully this block doesn’t need specific polarity. I’ve been sick since Monday. It’s been something like a stomach virus, but I’m really not sure. It’s amazing how much rest you can get when you’re supposed to be working. All I know is that is done this body much good. I’ve been playing around with speech recognition of Windows Vista again, And I’m not as impressed as before. For instance, I’ve been working on this blog entry for the last 10 minutes… and now I’m getting frustrated. Therefore, I’m going to cut the short. Good evening. oh, and my wife just walked in the door. Good night.